Index to Family Bibles or Histories provided by our members published in the TCGS Bulletin between 1961 and 2006. Cemetery records published in the TCGS Bulletin. Early birth and death records published in the TCGS Bulletin. Obituary abstracts for long-time area resident published in the TCGS Bulletin. Want More Benton and Franklin County Records? Hanford Site Photo Gallery: History, operation and cleanup of the Hanford site near Richland, WA. Use keywords Children, Hanford (last few pages are historical photos), People, School, Structures (historical buildings) and White Bluffs to location historical photos. Benton County, WA USGenWeb Site includes School Photographs, click here for names for searching. Washington Rural Heritage: Collections for Connell in Franklin County, Benton City and Prosser in Benton County and Grandview (near the eastern edge of Benton County). Potentially includes images, documents, video and/or audio. Date range for the whole collection is 1860s – 1999. Richland Flood of 1948 including memories from people who lived through it. Mid-Columbia Library’s Tri-City Herald Obituaries 1964-recent. 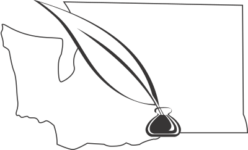 Start at Mid Columbia’s Digital Resources page and look for the Tri-City Herald Obituaries entry. a history of Richland street names including those created by the Manhattan Engineer District. Life in Richland, the Richland Bombers – Alumni Links is a collection of all things Richland. Scroll down to the “Sites of Interest” block. Columbians, Cougars & Warriors — school yearbooks 1942-1971. Grade School class pictures — 8 schools covering the future graduating classes of 1949-1987. Funeral Notices — from Tri-Cities and elsewhere; organized by surname at high school graduation. Often include yearbook photos. The Gallery, Misc. Pictures … — old time pictures of Richland businesses & locations. Houses that Hanford Built — the alphabet homes of Richland. Manhattan Project National Historical Park — creation of the park. Hanford Historic B-Reactor Tour — video introduction to the Manhattan Project plus links to many other videos about Hanford. B Reactor Museum Association – history, photos, videos explaining the reactor construction, operation. Hanford History Project – oral histories, White Bluffs families, pre-World War 2 & post World War 2 & B Reactor, Richland newspapers & photographs. Hanford History Project is a physical and online archive of history about Hanford nuclear production facilities & the surounding towns (now Tri-Cities).